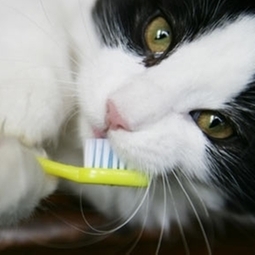 Good oral health is a vital part of maintaining the general health for your pet! Professional dental cleaning is necessary and often indicated when periodontal disease is present. Our own teeth are scaled by a dentist or hygienist - we sit in the chair and open our mouth when requested, letting the professional do their work. While the principles of good oral hygiene and dental health are the same for dogs and cats as for people, there are some significant differences. We understand why the procedure is important, and we typically do not need sedation or restraint. Neither is true for our pets. Another important difference between human and veterinary dental practice is that we tell the dentist when there is discomfort; to ensure that nothing is missed in dogs or cats, our patients require a thorough oral examination as part of a dental procedure. Professional dental cleaning removes dental plaque and tartar that cause periodontal disease. The dental deposits are removed by power (ultrasonic) and hand dental scalers. Following scaling, the teeth are polished to remove residual plaque and to smooth the tooth surface (which delays deposition of plaque and tartar subsequently). The mouth is rinsed to remove debris prior to a final inspection. The pet owner will be provided with recommendations for daily home oral hygiene specific for dogs or cats, and a recommendation made for a follow-up examination. Make your pets appointment today and start enjoying their kisses even more!